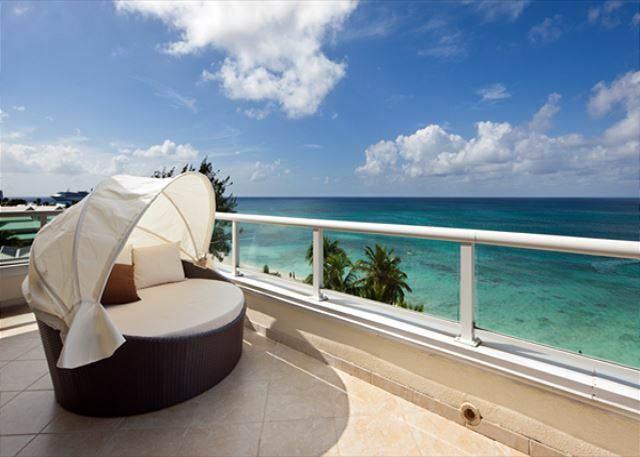 Located on the 5th floor villa # 31, is a corner unit with a spectacular view of Seven Mile Beach and the crystal clear waters of the Caribbean Sea from its exclusive upper level innovative Sky Yard Patio. 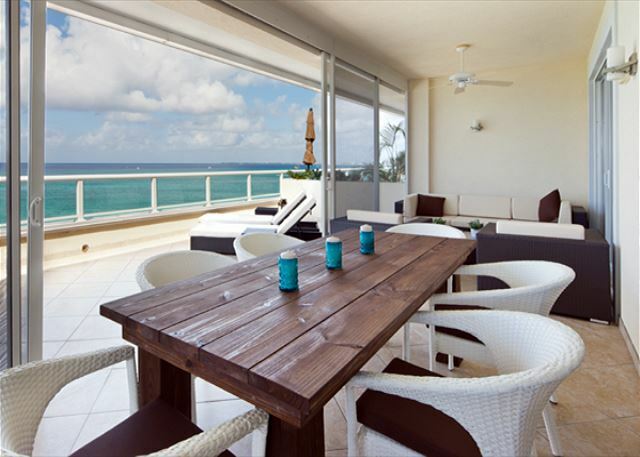 This spacious outdoor terrace provide the best of both worlds, with a fully screened enclosure and an open air private terrace with nothing but blue sky above enabling you to sunbathe at your leisure on comfortable patio furniture. 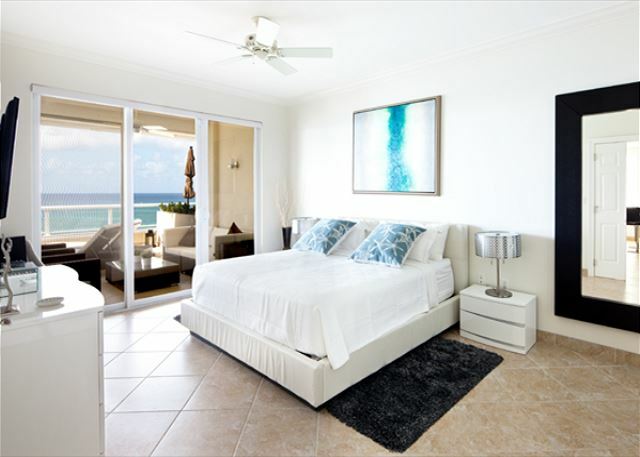 The master suite has direct access to the screened, open patio and a full ocean view. 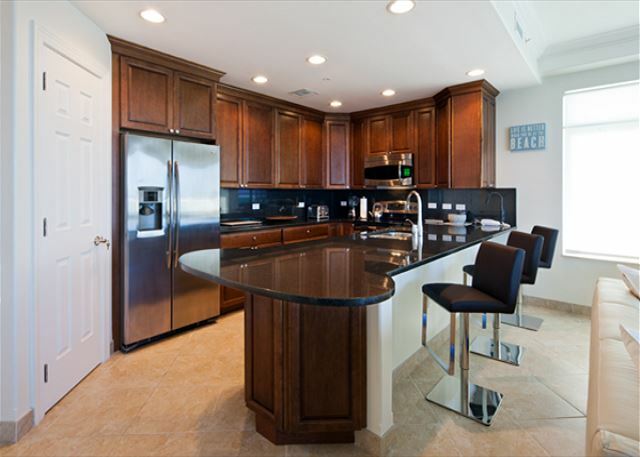 This 3 bedroom , 2bath villa has a fully equipped gourmet kitchen with a breakfast bar. Its spacious livingroom is furnished with comfortable sofas , a 55" flatscreen HD television , DVD player and Logic Network programming. 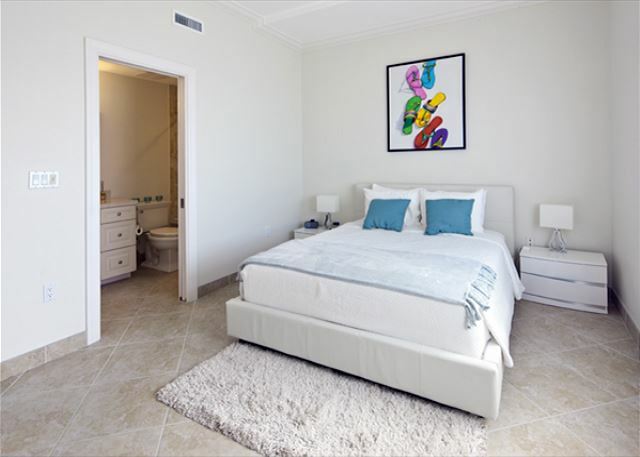 Each bedroom also has an HD flatscreen television. Bedding: Kingsize bed in master bedroom. Queen in guest bedroom, two twin beds in 3rd bedroom. 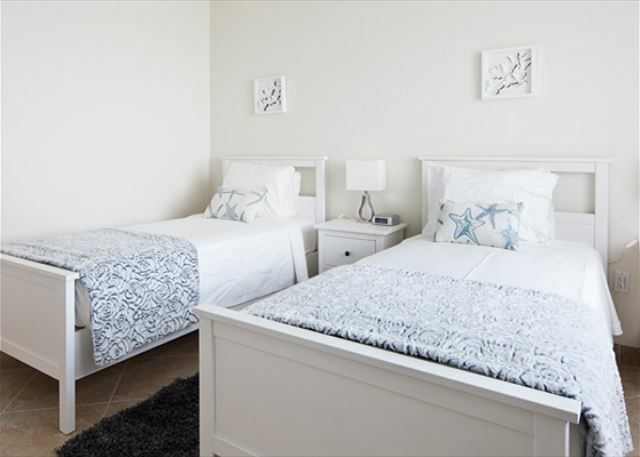 Additional amenities in villa: Fullsize washer/dryer, iron and ironboard, hairdryer in each bathroom and beach towels. 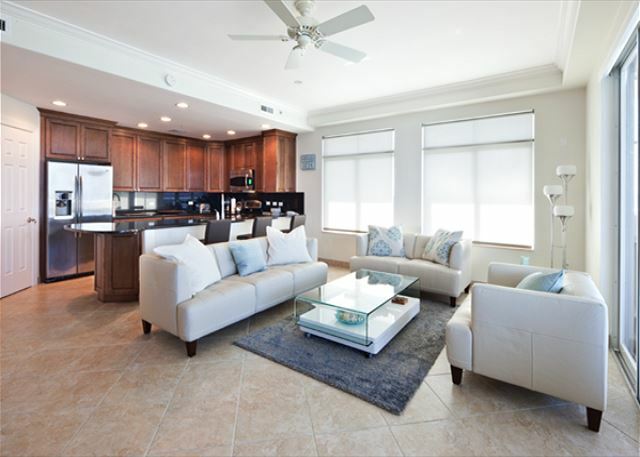 We rented two 3 bedroom condos at the South Bay Beach Club, to accommodate our extended family, including 2 grandparents, 3 grown sons, and their wives and grandchildren. 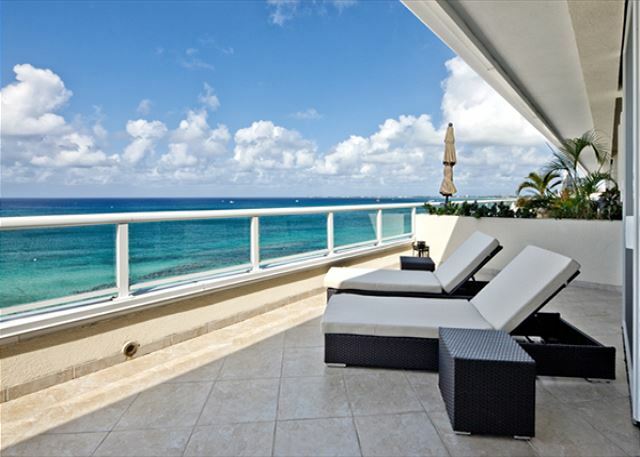 The accommodations were delightful and the location on Seven Mile Beach was spectacular. There was nothing more we could have asked for in either of the units. The staff were very friendly and did a great job tidying and cleaning each day. They also did grocery shopping for us. All in all, a wonderful experience. This was our third time staying at South Bay Beach Club and just as enjoyable as the first. Beautiful facility, spacious beach where chairs are readily available. Close to great restaurants and other attractions. We stayed on the 5th floor unit 31. The condo was spacious, clean and had everything we needed. We absolutely loved the huge screened in porch AND the very large sun porch. Only issue was the lack of beach due to a storm that had blown in day before we came. The staff worked hard and had pool operational within 2 days of our arrival(sand and seawater had blown in). We have stayed in many high end condos in the US, Turks and Caicos, Cabo San Lucas, etc and I will tell you this was one of my favorites!! Would definitely come back again! We had a great stay at the South Bay Beach Club! Villa 31 is wonderful! The patio area cannot be beat - we spent most of our time out there! The management is friendly, daily housekeeping was great, and a great location! We stayed in Villa 31 which has a large balcony with great views! Comfortable clean beds, kitchen well equipped and large tv area to hangout during the evenings with friends who stayed a smaller villa about a mile away. Glad I booked at the South Bay Beach Club. Not the normal property I stay at but larger and more comfortable. Since there were only 2 days of sun and lots of rain the nice large Villa made it easier. Complaint-no business center although was able to use computer and printer at front desk for short task. Wasn't aware of 1:00PM office closing on Saturday and no one at front desk when I arrived. Short wait but 5-10 minutes of not knowing where to go or what to do.Consider it minor issue. Would definitely stay again. 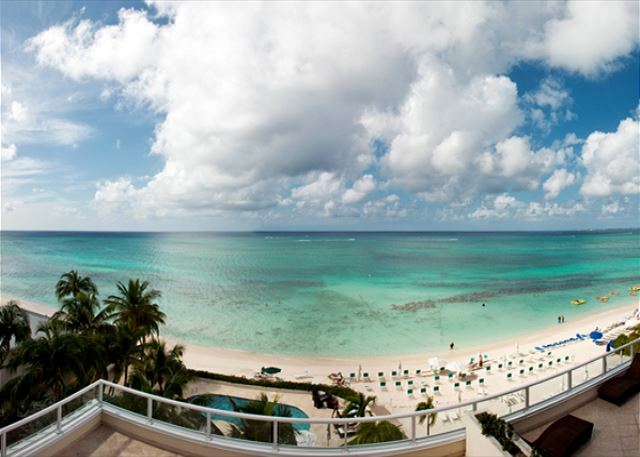 South Bay Beach Club is located on the southern end of Seven Mile Beach next to the Marriott. 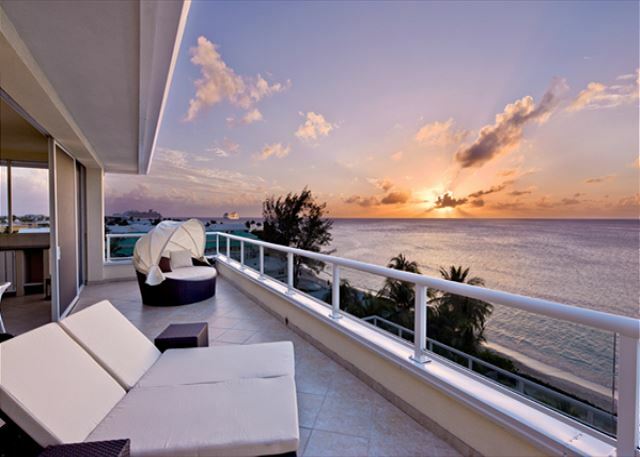 The Balcony on this unit is the highlight with amazing sunset views. The 3 bedroom layout is good although as with all South Bay Beach Club condo's you will share a bathroom, one of the bedrooms across the hallway from it. The unit itself is mostly well kept, but could use some maintenance and most importantly thorough cleaning. Dust buildup was noted throughout (clocks, top of bed, lighting fixtures, etc) and the tile floors very dirty. South Bay Beach Club itself and common areas are well kept though. Breath taking view. Condo in great shape and well appointed. Not many amenities but we knew that. Loved the unit, was perfect for our extended family, loved the location, pool and beach were exceptional. The complex was awesome, well taken care of and not busy.